Ah, the family camping trip: fun-filled days at the lake or river, restful afternoons lying in a hammock slung between two trees, roasting marshmallows by the fire, and snuggling into cozy sleeping bags at night. At least, that’s what glossy magazine covers and campground brochures would have you believe about the experience. If this idealized version of events doesn’t exactly mirror your own camping experiences, you’re not alone. My first few excursions into the great outdoors with my kids involved more work than play, more chaos than relaxation, and far more dirt (on everything) than I bargained for. In the years since, I’ve learned some tricks of the trade that have turned my camping trips into (almost) the postcard version. 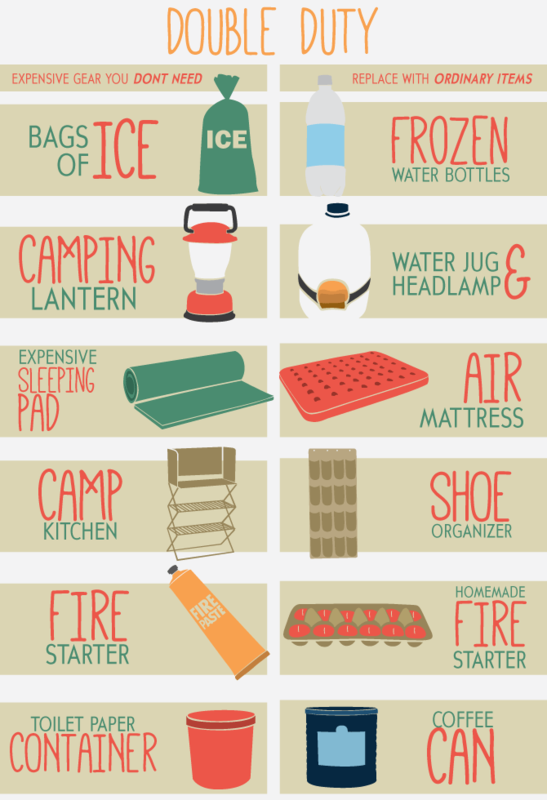 Unfortunately, not every camping item can be “MacGyvered” from items you already own. 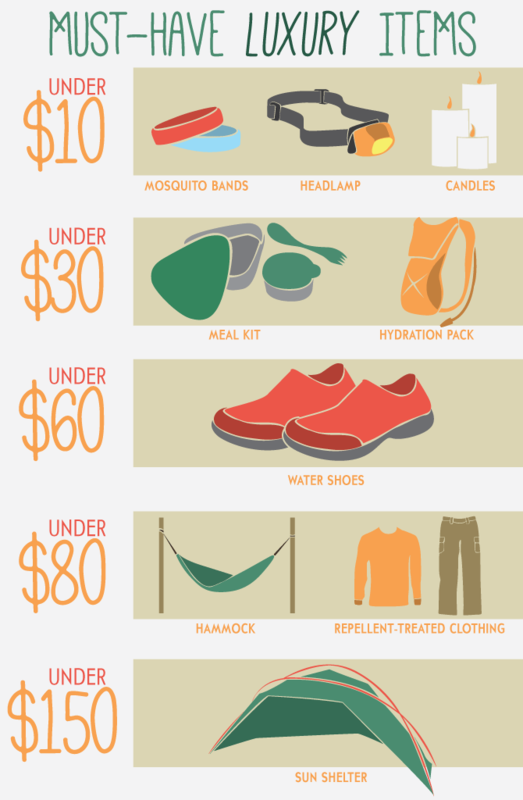 A few camping “luxury” items can go a long way toward ultimate comfort and fun in the outdoors. A good hammock: We stand behind the Grand Trunks Goods double hammock (as reviewed on PracticalTravelGear.com), which is easy to set up, comes in a compact stuff sack, and fits two people comfortably. Headlamps for everyone: A headlamp can be picked up for under $10 and allows for hands-free illumination. We’ll never return to clumsy flashlights again. Hydration packs: Want kids to stay hydrated? Outfit them with small hydration packs (one liter will do). Most day packs now fit hydration pack bladders, which can be purchased solo for under $30. Water shoes for the family: Say goodbye to stubbed toes and splinters in little feet. Water shoes can be worn in and out of water, performing double duty as light hiking shoes. We love the Keens and Columbia options. A dining set for every family member: Check out Light My Fire: this camping product company makes individual meal kits that include a plate, bowl, cup, and utensils that all fit together. Kids take pride in ownership, which means they’ll do their own dishes. Sun and shade shelter: Everyone remembers a tent, but many campers overlook the convenience and comfort offered by a sun and shade shelter. These simple canopies can be set up over picnic tables for shaded meals and card games or brought to the lakeshore to protect kids from the sun. Families can have all the right gear and convenient household items, but if you’re still slaving over the camp stove, your trip won’t be relaxing. The following dining hacks make meal prep and planning a breeze. We prefer to cook most of our meals over the campfire or on the BBQ to make food fun and clean-up simple. Grill fruit on the barbecue: Fruit is more appealing than grilled veggies to kids, and with a little whipped cream, you can skip the marshmallows. We prefer to create fruit kabobs with stone fruit such as peaches, pineapple, grapes (cut in half for young children), and strawberries. Local berries bought at farm stands or even picked by the family work well, too. Make “pocket” dinners: Create pockets of tin foil and fill with sliced potatoes, zucchini, onions, and other veggies, and then let them cook in the coals. It’s best to use heavy duty foil to ensure that ashes don’t get into your meal. Each pocket is customizable and fun to eat! Best of all, when you’re done, simply ball up your foil and toss it on the fire. Dishes are done! Pack milk substitutes instead of cow milk: Milk substitutes like soy, almond, and rice milk don’t have to be refrigerated, and vanilla or chocolate flavors are appealing to most kids, so there’s no need to worry about keeping milk cold for breakfast cereal. Skip the dishes: Use empty snack-size chip bags as individual serving “bowls” for chili, stew, or even oatmeal. Kids love these “on-the-go” containers. Don’t get fancier than boiled water: If you really want to simplify mealtime, buy dehydrated backpacking single- or double-serving meals. They taste just fine in the wilderness, require only boiling water, and take about five minutes to prepare. There is no need to drive hours for a family camping trip. Find a campground close to home to keep stress at a minimum. Plus, being near home allows for spontaneous camping or quick returns home for forgotten items. Check your region’s state park listings and then search for available sites online. KOA.com is a good resource for campsites with kid-friendly amenities, like pools or mini golf courses. A short drive and familiarity with the surroundings helps campers to relax more quickly. This entry was posted in Year Zero Survival Blog and tagged camping, camping hacks, camping tips, camping with children, outdoors, prepared, stress-free camping, tips by staff-writer. Bookmark the permalink.